Chinese smartphone brand Huawei has today launched its P30 Lite smartphone in India today, along with its flagship P30 Pro. Huawei P30 Lite smartphone is priced in the budget segment and comes with Huawei’s own processor, has a triple rear camera setup, the latest Android version and a 32MP selfie camera. 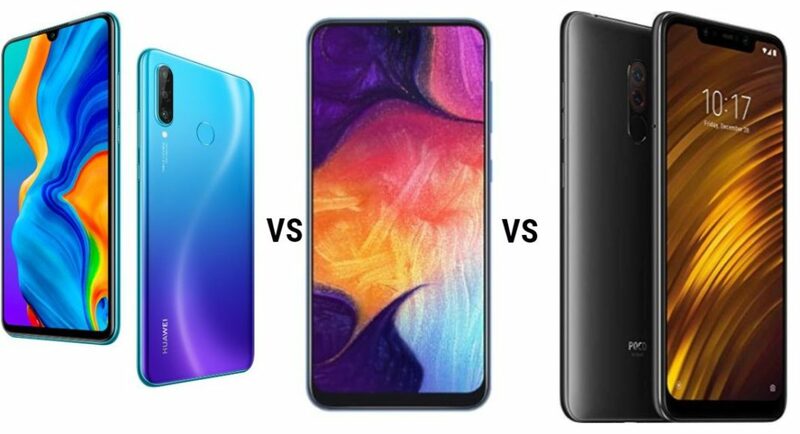 The price of the smartphone puts it in the same league as Samsung Galaxy A50 and Xiaomi POCO F1. Here, we have listed down the specifications of all the three smartphones so that you can decide which one is the right buy for you. Huawei P30 Lite: 24MP wide-angle primary sensor, an 8-megapixel ultra-wide-angle sensor, and a 2-megapixel depth sensor. Samsung Galaxy A50: 25MP sensor with an f/1.7 aperture, a 5MP sensor with an f/2.2 aperture and an 8MP sensor with an f/2.2 aperture. Xiaomi POCO F1: 12MP Sony IMX363 sensor along with a 5MP depth sensor from Samsung. Huawei P30 Lite: 32MP sensor that comes with an f/2.0 aperture. Samsung Galaxy A50: 25MP sensor with fixed-focus and an f/2.0 aperture. Xiaomi POCO F1: 6GB/8GB of RAM with 64GB/ 128GB/ 256GB internal storage. Huawei P30 Lite: Yes, up to 256GB. Samsung Galaxy A50: Yes, up to 512GB. Xiaomi POCO F1: Yes, up to 256GB. Huawei P30 Lite: Android 9.0 Pie skinned with EMUI 9.1.